Mike Smith, a motivational speaker that brings a message of anti-bullying, hope, and wellness to students across the country, will be at Chadron Public Schools on December 5th. In a little over two weeks, students at CMS raised over $800 to bring him to Chadron (motivated students can do amazing things)! He will present to CPS students in all four buildings during the day on and then to parents and community members in the evening. Mike Smith will present to CMS students from 2:00-3:00 at the HS auditorium and then to all parents and community members from 5-7pm in the MS library. Alex Sanders, Mikaela Hastings, and Jayden Garrett went on KCSR 610 AM radio on 11/30/11 as representatives for the 8th grade health class that started the effort to bring Mike Smith to CPS. In addition, their class has started a group called Helping Others Protect Everyone (H.O.P.E.) in an effort to provide peer support to students that are struggling with bullying and to strengthen our school community. For information about Mike Smith's program go to www.mikesmithlive.com or just click on the link under web articles on this blog page. December 15th - 6th-12th Band and Choir concert @ HS Auditorium. Band starts at 6pm and Choir starts at 7:15pm. 2010-11 Nebraska State Report Card Results for Chadron Public Schools has been released and once again our district has a lot to celebrate! Our district has exceeded state and federal accountability requirements. Please take a moment and convey to educators and students how much you appreciate their efforts! The State of the Schools power point slide show can be viewed at: www.chadronschools.org. Congratulations CARDINALS! English, Science, and Math teachers have been busy working on curriculum alignment as part of our continuous school improvement effort. The work that they have been doing includes curriculum mapping, standards alignment, and vertical curriculum alignment K-12. Teachers in core content areas have also been working on setting NWEA goals with their students that include RIT score goals and a student self assessment. MOA, the architect firm that CPS has contracted with for the proposed facilities rejuvenation project, released it preliminary plans to the public at a special Board meeting on November 7th. “Safe, Warm, and Dry” is the phrase that we are using to describe the plan, which includes roof repairs and replacement, HV/AC upgrades and controls, air quality improvements, window improvements, and lighting upgrades. If you have any questions regarding the plan, please feel free to contact Mr. Dressel at 432-0708 or nichlas.dressel@chadronschools.net. The first dance of the school year was held on Friday, November 18th, 2011 at the CMS gym. The CMS Student Council planned and organized the dance that included a professional D.J. complete with lights and lasers! Students enjoyed and danced to music from various contemporary artists as well as some classic rock. Thank you to the CMS student council for their efforts in organizing the dance and to the faculty and parents that helped chaperon. It was a fun evening for our students! 8th grade students from Mrs. Kaus' 4th period social studies class paid tribute to our nations veterans at the annual Veterans Day Program on November 11th. The students did a wonderful job of putting together the program and playing the role of Masters of Ceremony. The keynote speaker was Sgt. First Class Shawn Banzaff of the United States Army National Guard. His message highlighted the need to continue to honor and respect our Nation's veterans as well as those who are currently serving in the armed forces. He also talked about the humility that veterans display when they come back from war. Thank you to Mrs. Kaus and the students from her 4th period class that organized the event for all of the hard work that they put into the Veteran's Day program; they did a fantastic job! Thank you to Sgt. Banzhaff for his excellent keynote address. And, especially, thank you to all of our Nation's veterans for their service and sacrifice. 7th and 8th grade students attended the Chardron High School One Act Play production of Yes, Virginia, There is a Santa Claus during 9th period on November 22nd. Thank you to Mrs. Paopao for allowing our middle school students to enjoy their production. 7th & 8th Graders Rock "Club Cardinal"
The first dance of the school year was held on Friday, November 18th, 2011 at the CMS gym (aka Club Cardinal). The CMS Student Council planned and organized the dance that included a professional D.J. complete with lights and lasers! Students enjoyed and danced to music from various contemporary artists as well as some classic rock. Thank you to the CMS student council for their efforts in organizing the dance and to all of the faculty and parents that helped chaperon. It was a fun evening for our students! The wrestling meet at Bridgeport that was scheduled on 11/21/11 has been cancelled. There has not been any word as to whether or not it will be rescheduled. Brenna Hawthorn, a 7th grade student at Chadron Middle School, created an original poster that has been selected to advance to the State 2011 National Association of Conservation Districts (NACD) Poster Contest. The Upper Niobrara White Natural Resources District, the Nebraska Association of Resources Districts and the National Association of Conservation Districts are sponsoring the 2011 poster contest with the theme: Forests for People: More Than You Can Imagine! Brenna's poster is being judged on it's conservation message, visual effectiveness, originality and universal appeal. Good luck at the state competition Brenna! CPS Curriculum Director, Maribeth Moore, will present the State of the Schools to CPS faculty at an in-service on Friday, November 18th. Once again, our students' scores were outstanding! Our teachers and students should be commended for their excellent work! Check out the CPS State of the Schools Power Point at State of the Schools. We have a 1:30 dismissal on Friday, but due to the in-service, we will not run Friday School (1:30-3:20) for students that are missing work. All late work needs to be turned in by the end of the day on Friday to receive partial credit. Any work that is not turned in will receive a zero. 8th grade students from Mrs. Kaus' 4th period social studies class paid tribute to our nations veterans on Veteran's Day last Friday. The students did a wonderful job of putting together the program and playing the role of Masters of Ceremony. The keynote speaker was Sgt. First Class Shawn Banzaff of the United States Army National Guard and his message highlighted the need to continue to honor and respect our Nation's veterans as well as those who are currently serving in the armed forces. He also talked about the humility that veterans display when they come back from war. 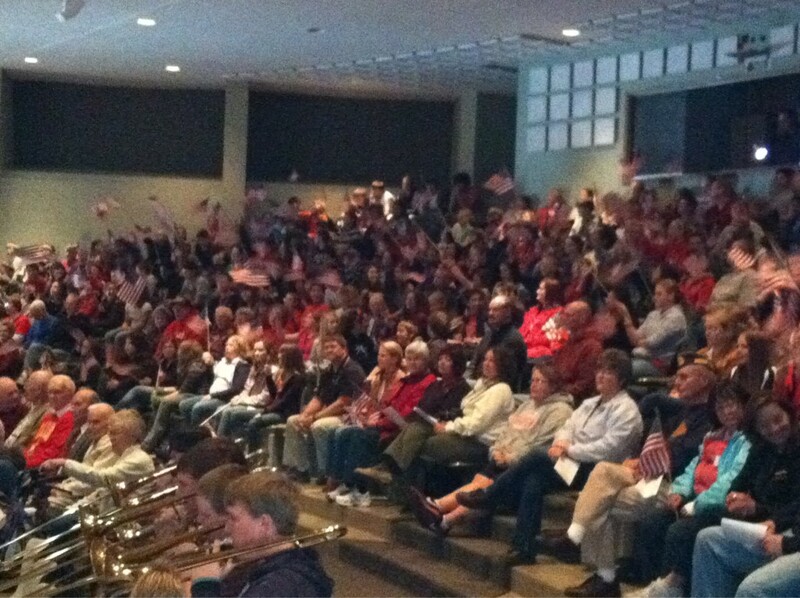 One especially touching moment was when the students paid tribute to the veterans of World War II. Sgt. Banzaff said, "..these men and women are just mom, dad, grandma and grandpa to us, but they saved the world." The Department of Veteran's Affairs estimates that 1,100 WWII veterans die every day and they take with them the living history of the war. It is crucial that we learn and record this history for the sake of posterity. Thank you to Mrs. Kaus and her 4th period class for all of the hard work that they put into the Veteran's Day program; they did a fantastic job! Thank you to Sgt. Banzhaff for his excellent keynote address. And, especially, thank you to all of our Nation's veterans for their service and sacrifice.